Students who earn a Ph.D. in accounting can raise their earning potential and prepare themselves for careers working in highly specialized areas of accounting, think tanks and universities. According to PayScale, graduates with a doctorate in accounting can earn, on average, upwards of $170,000 per year. The American Institute of CPAs reported an unemployment rate of 4.2% for accountants, which is significantly lower than the national average. The Bureau of Labor Statistics projects a job growth rate of 11% in the field between 2014 and 2024, a figure that is much higher than the average projected growth rate for all U.S. occupations. These figures indicate graduates of doctoral level accounting programs are set to enter a dynamic and fast growing field with a high demand for increasingly qualified accounting specialists. A doctorate in accounting will prepare you for a wide array of jobs in the field, including working as a researcher or postsecondary instructor. The doctoral accounting program is meant to build off of fundamental skills already acquired in finance, economics, and mathematics. While every program's admission requirements vary, some programs may specify that some previous experience is preferred, if not required. Many programs look for applicants who have a strong background in finance, mathematics, and economics from their undergraduate and/or graduate coursework. Other programs may put more of an emphasis on work experience. When looking for the right program, consider your own lifestyle, schedule, and personal obligations. If you have a full time job and/or you have a busy home life, you may want to consider choosing a program that is self-paced and asynchronous to allow you to complete work on your own time. Online programs are great for working professionals who want to earn their graduate degree on their own time. The flexibility of earning your degree online allows you to work classes and coursework into your existing schedule. Since there are no on-campus requirements, students can complete coursework when it is convenient for them. One of the largest online colleges in the nation, Liberty university offers a number of fully online graduate business programs, including the doctor of business administration in accounting. This program emphasizes in-depth analysis of tax and auditing theory and techniques, which prepare students to ascend the corporate ladder and pursue a variety of high-level accounting positions. The 60-credit online doctorate in accounting can be completed in nine semesters and includes coursework on a variety of topics, such as advanced research methods, strategic allocation of financial resources, quality management and productivity, advanced auditing, and accounting ethics. Online courses are delivered asynchronously, allowing students to complete coursework at their own pace. Students can transfer up to 15 credits towards their doctorate in accounting degree. Applicants must have an MBA, MS in accounting, MS in information systems, or MS in management information systems with a minimum GPA of 3.0 to be considered. Liberty is accredited by the Southern Association of Colleges and Schools Commission on Colleges. GFU offers a doctor of business administration in accounting that is ideal for business educators who want to advance their career. 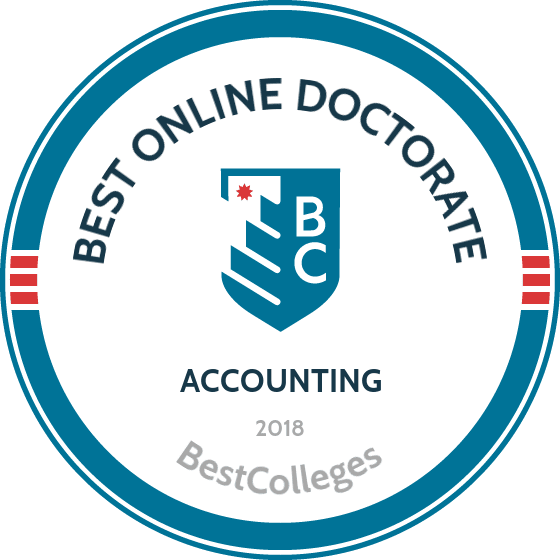 This 56-credit doctorate in accounting is comprised of main bodies of coursework in business, research, and education, as well as a required teaching practicum and a dissertation. The curriculum includes courses on a variety of topics, such as faith and spirituality in business, management and leadership, seminars in accounting, research methods, and issues in higher education. Students can earn their degree in three years of full-time study, with an addition year set aside for work on their dissertation. This hybrid program requires two on-site visits to the campus in Newberg, Oregon, each year. Applicants must have a master's degree with a minimum GPA of 3.0, full-time faculty appointment or five years of professional experience, and previously completed baccalaureate and graduate-level courses in accounting, finance, and economics to be considered. This online doctorate in accounting is accredited by the Accreditation Council for Business Schools and Programs. Online doctorate programs vary from school to school. The curriculum differs in terms of required and offered courses. Some programs are offered in a cohort format, requiring students to complete coursework in a synchronous manner along with a group of peers. Each program and school has its own curriculum and degree requirements. Below are a few sample courses that you may take while pursuing a doctorate in accounting. Accounting Theory: This course looks at general financial accounting theory. It may also cover how to implement these theories in practice, as well as methodological issues. This course also provides an overview of topics such as agency theory and budgetary control systems. Topics in Auditing: This general course will look at issues and trends in auditing. Students will examine current text that explores internal and external auditing, as well as modern auditing theory. Business Ethics Seminar: Most doctoral programs include special topics courses taught as seminars. A business ethics seminar explores the various decision-making and judgment processes in business. There are many factors that affect the length of an online doctorate in accounting. A cohort-based program may require more time to complete since students must follow a set pace. An individually-paced program allows for more flexibility for you to complete coursework on a timeline of your own design. Most programs that require students to enroll part time will take longer to complete than programs that offer full-time enrollment. A doctorate in accounting requires between 55 and 75 credits to complete. Many of these programs will take around three and a half to four years to finish, but usually allow more time if needed. Accreditation is an important factor to consider when choosing your program. When a school is accredited, it means that it meets certain academic standards. Schools are either regionally or nationally accredited. Regional accreditation is considered more prestigious. National accreditation is usually awarded to vocational and career-oriented schools. Regional accreditors include the Higher Learning Commission, which accredits schools in 19 north central states that meet its criteria. Doctorate in accounting programs will likely be accredited by the Association to Advance Collegiate Schools of Business. Check their website and database for a list of schools and programs they accredit. The U.S. Department of Education (ED) is a government agency that handles policies in the school systems. The Council for Higher Education Accreditation (CHEA) is an organization of 3,000 degree-granting colleges that advocate for self-regulation of academic quality through accreditation. CHEA recognizes 60 accrediting organizations. The ED and the CHEA provide a comprehensive list of their recognized, accredited, post-secondary schools on their websites. According to a report from Forbes, 61% of accounting graduates in 2013 left school with at least one job offer. This success is further exhibited in the rising enrollment rates in Ph.D. programs in accounting. More and more accounting students are choosing to pursue a graduate degree in accounting, and many of those doctoral graduates are going on to pursue successful careers in postsecondary education and large corporations. The table below outlines the enrollment in graduate accounting programs from 2006-2012. Earning a doctorate in accounting online will prepare you for new and exciting career opportunities. Graduates are also projected to earn a higher average salary than those with undergraduate degrees. The table below features data from PayScale regarding the range of salaries for accountants holding different degrees. Many graduates of doctoral programs decide to remain in academia upon graduation, but there are a number of other careers available. Below, you will find a few examples of potential careers for graduates of accounting doctoral programs to consider. Postsecondary teachers are tasked with planning and teaching assigned courses. They also handle administrative duties related to their department. Accountants and auditors work in finance to prepare and examine various kinds of financial records. They check whether records are accurate, and also ensure that taxes are paid correctly. Some accountants work in businesses to find ways to optimize their day-to-day functions. These advisors work with individual clients and/or businesses to help them plan for investments and major expenses, including insurance, mortgages, savings, estate planning, taxes, and retirement. These analysts use their accounting and business skills to provide businesses and private clients with guidance and advice for making investments. They also examine the performance of stocks and other kinds of investments. A budget analyst works with private and public businesses and institutions to prepare budgets and monitor their spending. They may work in for-profit or nonprofit settings, including government agencies. Professional organizations are valuable assets to students pursuing a graduate degree. Students in doctoral accounting programs can take advantage of the resources these organizations provide to network, learn about job opportunities, and contribute to research in the field. Upon graduation, these organizations can connect graduates with job openings, and they often offer conferences and professional development events to keep members connected with other professionals in the field. Founded in 1916, the AAA is a large community of accountants in academia. They encourage innovation and collaboration among members and produce leading research and publications in the field. The AICPA was founded in 1887 and advocates for members. They represent the accounting profession on a national level. They honor a code of professional ethics and provide members with a wide variety of resources and opportunities for networking. This organization serves those in the accounting professions on a global level. They serve public interest and develop strong international economies. They offer yearly events and various publications, including podcasts. Online doctorate degrees are typically cheaper than ones earned on-campus, but many students still need financial help. Most online schools offer financial aid to online students. All online students should fill out the Free Application for Federal Student Aid (FAFSA). Students applying for aid must be enrolled in an online program that has been accredited by a federally recognized agency, such as the AACSB for accounting programs. Students in online accounting doctoral programs might also consider applying for program-specific scholarships through major organizations in the field, including large companies and local firms.